Are you feeling isolated and stressed? Caregiving is challenging, lonely, and can feel completely overwhelming. Caregivers Central is here to help. You are not alone. You’ll have support, community, tools and resources to help you navigate your caregiving journey with less stress and more ease. Caregivers Central is for ordinary people who find themselves responsible for the care of someone else. Caregivers Central offers a unique blend of community, support and resources from people going through similar challenges, combined with practical tools you can use in the moment to calm your nervous system. You will be less stressed and more at ease as you navigate your caregiving journey. That’s better for you AND better for your loved ones. 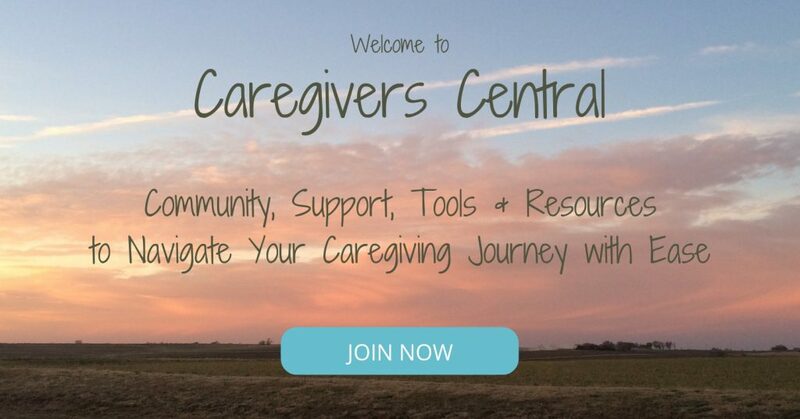 Caregivers Central, created by Laura Donnelly and Imogen Ragone, supports all phases of the caregiving journey. We share the tools we have found valuable in our own caregiving journeys in a supportive community. We are both experienced teachers and practitioners of the Alexander Technique, which is a simple method for being easier in your mind and body in all situations. When you’re less stressed and more at ease in yourself, you not only feel better but can be a better caregiver for your loved one. As a member of Caregivers Central, you will learn easy, mindful ways to reduce stress and reconnect to your center in the ever-changing world of caregiving. And, you will become part of a community of people in similar situations who will support you. This short 2-minute “exercise” helps you reduce stress and cultivate more ease in your life. Imogen or Laura will lead the practice online and members can join live and/or watch the recording later. This is an important and foundational stress-relief self-care tool for us all. There will be time to answer questions afterwards (either live or submitted ahead of time). Ongoing access to the videos of practice sessions and discussions, which will be posted and saved in our private Facebook group. Once a month we’ll have an informal online get together for community members. Members will be able to ask questions, catch up with each other, and share challenges and successes with each other. We’ll sometimes have invited speakers to talk to us about relevant topics, such as tips on hiring a professional to help care for your loved one, or easy ways to incorporate self-care into your day. In our private Facebook Group, you can ask for advice on different aspects of the journey. For instance, you may want to know what documents it is helpful to have in place before a major healthcare incident, need help understanding different care options, seek advice about hiring help or choosing a care home. There are so many new things we have to deal with and make decisions about – our community members can help each other with knowledge gained our own experiences. You will have a safe, private place to vent! Caregiving is not easy. Getting our frustrations out, and being heard by people who understand what you are going through, is invaluable. We invite you to become a member. The cost is $25 per month for as long as you are a member! Long-term we anticipate that Caregivers Central will continue to grow in scope and price. Help determine the initial content and direction based on your needs. Get access to all new materials, content, and sessions added to the program at no extra cost. We are all here for each other. You are not alone. “All of us humans have moments in our lives that we feel broken like a vessel. The real challenge is what do we do then? How do we progress? The best outcome, of course, is to not only mend but rather to be able to utilize these experiences to grow and better ourselves. “Imogen Ragone and Laura Donnelly help individuals fill the cracks with gold. They do it with their gentle and compassionate words and tones, they do it with their skills and understanding and allow us to go on despite experiencing hardships. Caregivers Central is for anyone who finds themselves responsible for the care of someone else. You may not think of yourself as a caregiver, but you are a caregiver if you’re responsible for the care of someone else in any way. It’s for you if you care for a loved one long-distance. Your loved one – often a parent or other relative – lives in a different town, state or even country. You’re responsible for their care, but you don’t live with them or even nearby. You manage a lot of things remotely. And when you go to visit you dive into full-on in-home care for a brief period. It’s for you if you care for your loved one at home full-time – or if you’ve moved into their home to take care of them. It’s for you if you live close to your loved one. You may find yourself going back and forth weekly, daily, or even multiple times a day. You may live close enough that you can do day trips sometimes but are also doing a lot remotely. It’s for you if your loved one is in a care home, but you’re the one responsible for making sure their needs are met. It’s for you if you’ve arranged for professional in-home care visits for your loved one. It’s for you if you share caregiving responsibilities with other people, often other family members. Caregiving comes in many different forms, and that form can change suddenly and often. Caregiving responsibilities even continue after the death of your loved one. Basically Caregivers Central is for you whatever form caregiving takes for you. Please join our community and get the tools and resources to support you throughout your unique caregiving journey. Laura with her brother and mother. Laura Donnelly is a teacher, coach, choreographer, dancer, and writer. Her work, Dancing with Ease – Body-Brain Balance, is based on the Alexander Technique and focuses on ease and balance in life and art. Laura’s experience with caregiving for family members began when she was a child. She lived in close proximity to her mother’s extended family and there were always members of older generations who needed assistance (grocery shopping, changing light bulbs, heavy cleaning, etc.). When Laura’s mother became the primary caregiver for her grandfather, Laura witnessed the added stress her mother experienced. Laura’s grandfather was blind and the family (Laura’s aunts and uncles) kept him in his home as long as possible. In the late 90s, Laura’s husband’s mother was diagnosed with Alzheimer’s. While her husband was the primary caregiver, Laura assisted with short trips, general companionship, and supporting her husband. 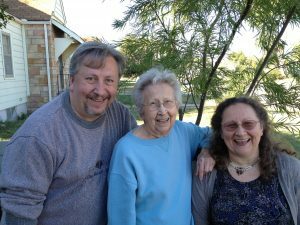 Then, in 2015, her mother experienced an exacerbation of her COPD symptoms and chose to go into hospice care. Laura and her brother cared for their mother in her home for 6 months before she passed away. Laura began studying the Alexander Technique in the late 1980s to improve her dance performance and quickly realized that the process would fundamentally change how she lived. She began studying seriously and encouraged her mother to study the Technique also. They spent many hours applying the principles of the Technique to the study and teaching of ballet. 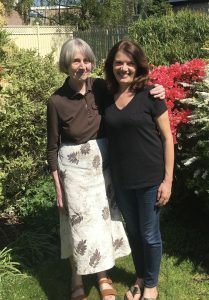 Then, when her mother went into hospice, they found practicing the Alexander Technique allowed them to be present, kind, and both sad and grateful for a long life with many wonderful shared experiences. Laura has an MFA in Theatre Arts/Dance from the University of Arizona. She toured throughout the U.S. and Europe as a professional dancer performing ballet, modern and historical dance. She has taught dance in universities, public schools, and private studios and her choreography has been performed in the U.S. and Europe. She has taught Alexander Technique privately and at universities since 1992. 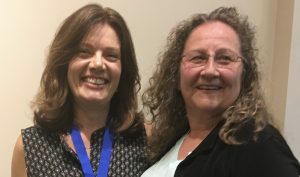 She now lives in Kansas and teaches Body-Brain Balance based on the principles of the Alexander Technique in-person and online to people from all walks of life. Imogen and her mum, less than an hour before we moved her into a care home. Imogen Ragone created the BodyIntelligence program to help women transform stress and tension into ease, confidence and inner calm using the Alexander Technique. She originally came to the Alexander Technique as the solution to chronic neck pain and tension. While initially she was only interested in relief from the pain and tension that had taken over her life, she soon discovered other benefits way beyond anything she had imagined, including a sense of ease and flow in herself and the way she moved, more energy, increased confidence in herself, and a renewed joy in life itself. Imogen now has over 12 years experience teaching this transformational approach to others. One of the most important features of Imogen’s approach is a strong focus on self-care, providing a practical way for you to take care of your greatest asset – YOU. BodyIntelligence is a way to put yourself at the top of your priority list in a way that is the opposite of selfish – in a way, that benefits everyone and all you do. Many of us, and especially women, find ourselves in caregiving roles and put ourselves at the bottom of our priority list. To be able to look after others well – our children, our parents, our spouse, anyone – we must look after ourselves well, too. This is a matter close to Imogen’s heart, as she deals with her ever-changing role with her own parents for whom she has been caring long-distance for over three years. Earlier this year that role changed dramatically following the death of her father and moving her mother, who has Alzheimer’s, into a nursing home. The tools of the Alexander Technique have been invaluable to Imogen as she goes through this journey, and to her clients in similar situations. This work will help you in the the practical physical situations you find yourself in (e.g. learning to move someone else without undue strain on yourself), and the emotional ones, so you learn to be with yourself in a more compassionate and constructive way as you manage many stressful situations. Imogen lives with her husband, son and two cats in Wilmington, Delaware. Her mother lives in Sheffield, England, where Imogen grew up. Contact us: If you have any questions, please contact Laura and Imogen at info@caregiverscentral.net. Stay in touch. Subscribe to the Caregivers Central mailing list for information, tips and advance notice on upcoming events to help you navigate your caregiving journey with ease.